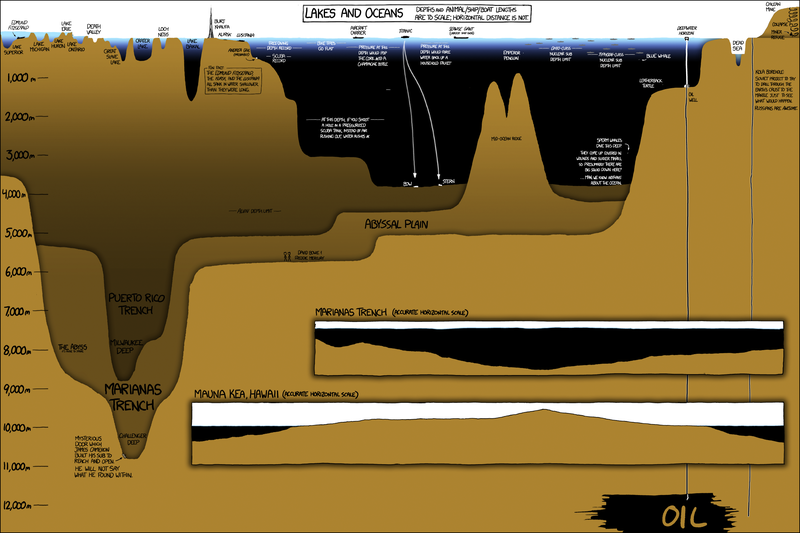 Do you ever think about just how far into the Earth the ocean actually reaches at its greatest depths? 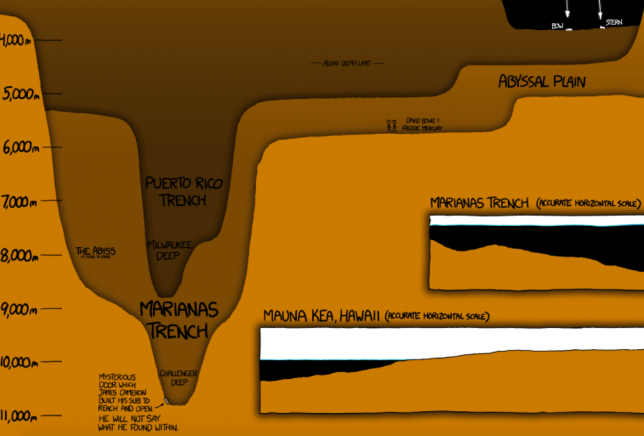 Truly the last frontier aside from outer space and the core of the Earth itself, much of the area below the ocean’s surface remains unexplored despite the fact that it represents 95% of the living space on this planet. 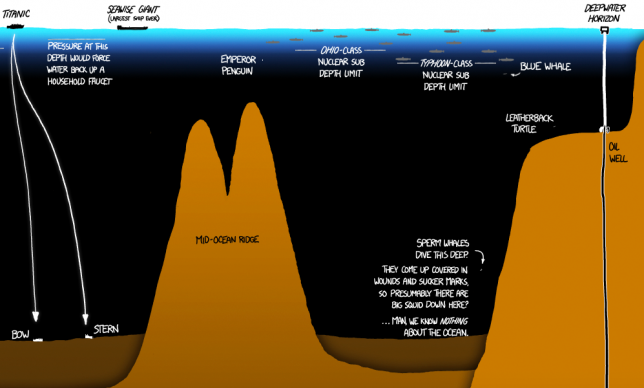 We know very little about what it looks like down there and what kinds of creatures might be lurking in its darkest corners. 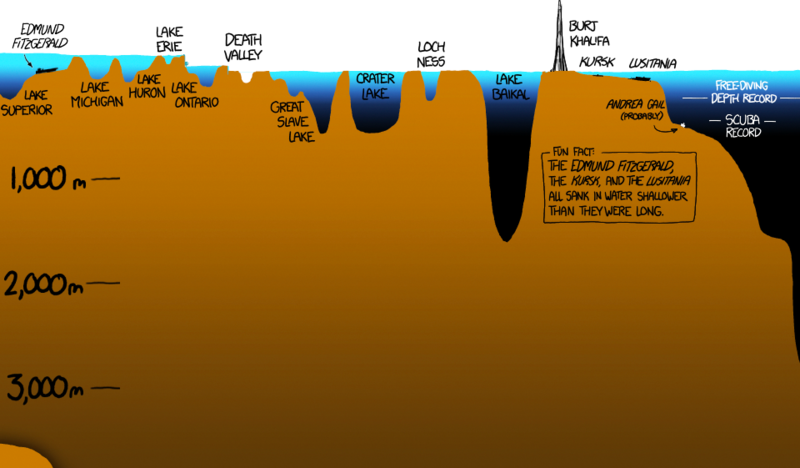 To put it all into perspective, webcomic Xkcd.com created an infographic comparing various oceanic features to markers like the world’s deepest lake and tallest building. Note the Burj Khalifa, taller than Crater Lake is deep. While Lake Baikal in southern Russia, the deepest lake on Earth, reaches 5,387 feet below the surface (compare that to Lake Huron’s mere 751 feet), the deepest spot known to scientists hits an incredible 10,994 meters (36,070 feet.) That’s 6.8 miles. Now, consider the fact that we’ve trashed the planet so thoroughly, divers have found a heartbreaking amount of trash and toxic pollutants within this crater in the Pacific Ocean. It may be remote, but pristine it is not. At least, not anymore. But do we have to explain the Freddie Mercury and David Bowie reference? Click here to view the infographic full-size.